Our school football team continue to be busy and are improving each game. We played out a hard fought Thursday night match against Hotspur Primary which ended in a 2-2 draw in a see saw affair. 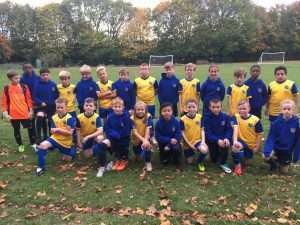 This Wednesday (24 October) we played three matches. We lost narrowly to St Bernadette’s and Sacred Heart, losing 2-1 in both fixtures. However we managed to bounce back with a 3-1 over St Joseph’s in North Shields in our last match. The team has a lot of talent and are slowly finding consistency in their performances.